Dr. Aung graduated from the University of Arizona with a Bachelor of Science degree in 1986. She then attended and graduated from the University of Osteopathic Medicine and Health Sciences in Des Moines, Iowa with a Doctorate in Podiatric Medicine in 1990. Following postgraduate training Dr Aung established and has maintained a private practice for over 21 years in Tucson, Arizona with a focus in care of the lower extremity, advanced wound care/limb preservation, and amputation prevention in the diabetic patient population. 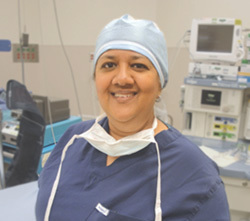 Along with her credentials as a podiatric physician and surgeon, Dr. Aung also is a Board Certified Wound Care Specialist (CWS)-(American Academy of Wound Management), a Fellow of the American Professional Wound Care Association, as well as a Diplomat, of the American Board of Podiatric Orthopedics and Primary Podiatric Medicine. She currently serves as a consultant and staff member of a number hospital based wound care centers in the Tucson and Southern Arizona. She is also active in numerous clinical research studies related to wound care and advancements in this field and serves as a consultant to a number of product/device companies serving the wound care industry/arena. Dr. Aung has served as a member of the CDC/NIH National Diabetes Education Program PPOD work group representing the American Podiatric Medical Association and the Podiatric Medicine Profession. Dr. Aung has been a member of The University of Arizona Telemedicine Virtual Diabetes Center of Excellence providing both clinical education to medical professionals as well as patient evaluation, disease management, advance wound care and amputation prevention through the center’s Telemedicine network to remote and rural clinics throughout Arizona. Dr. Aung served as the Chair/Lead Trainer for the State of Arizona’s Department of Health Services Diabetes Prevention & Control Program Amputation Risk Reduction Project that advanced and increased preventive screenings in both primary care and specialty clinics throughout Arizona. She also serves as a consultant in diabetic foot care and amputation prevention on local, regional & national levels for Native American, Community & Rural Health clinics in addressing the lower extremity care needs in the diabetic patient population. Dr. Aung is a contributing author for numerous publications providing guidelines of lower extremity management in the diabetic patient population for clinicians, is as well a published author of numerous articles in the field of podiatric medicine, advanced wound care, disease management, practice management and likewise presents nationally on the aforementioned topics.